The name for this Lactarius is apparently invalid (see the discussion below), but the mushroom itself is valid enough--and it probably doesn't care what we call it. Common in the northern Great Lakes region under conifers in late summer and fall, it has a sticky lilac-tinged cap, a stem that often features potholes, and white milk that dries greenish on the gills but does not stain them brown or purple. Ecology: Mycorrhizal with conifers in boreal ecosystems--especially spruces, eastern hemlock, and balsam fir; growing scattered or gregariously; late summer and fall; the northern Great Lakes region, east to Maine and Nova Scotia. 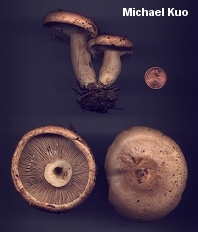 Cap: 3-15 cm across when mature; convex, becoming flat with a central depression, or shallowly vase-shaped; pale cinnamon buff with lilac overtones, fading to dirty yellowish or pale dingy tan; without zones; bald; sticky to slimy when fresh; the margin at first inrolled but later uplifted, often becoming lobed. Gills: Beginning to run down the stem; close or nearly distant; creamy whitish when young, becoming pinkish; stained slowly greenish to olive by the milk where damaged. 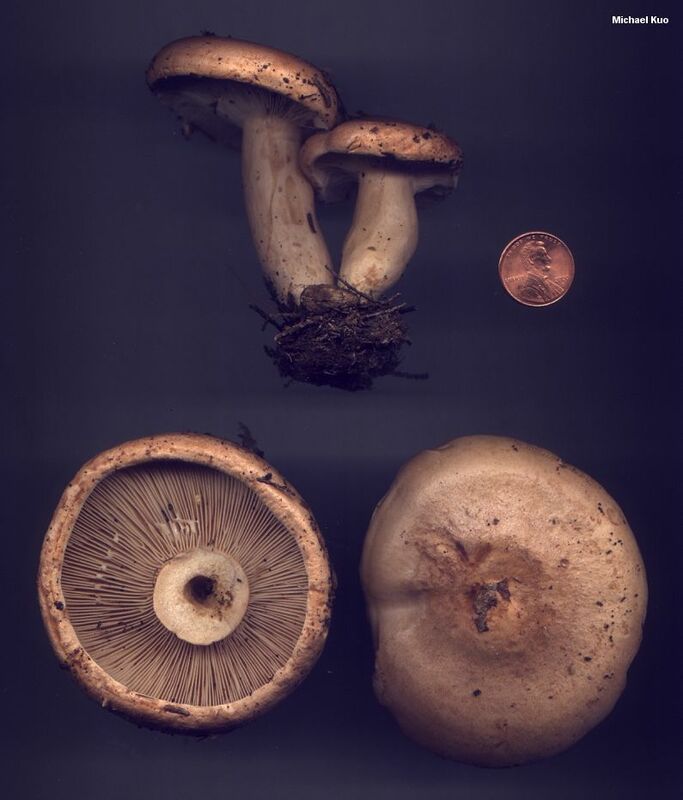 Stem: 4-12 cm long; 1-3 cm thick; more or less equal; colored like the cap, or paler; sticky when young and fresh but soon dry; bald; often with large potholes; discoloring brownish, especially near the base. Flesh: Whitish; stained greenish by the milk where damaged. Milk: White; drying pale green and staining tissues greenish to olive; staining white paper yellow overnight. Chemical Reactions: KOH on cap surface yellow to pale olive. 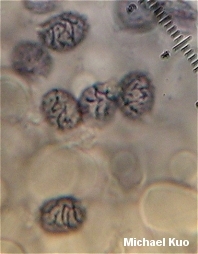 Microscopic Features: Spores 8-10 x 6.5-8 µ; broadly ellipsoid; ornamentation about 1 µ high, composed of warts and ridges that form partial to nearly complete reticula. 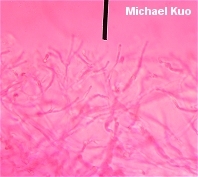 Pleuromacrocystidia subclavate to cylindric at first, becoming tapered or fusoid-ventricose; to about 100 µ long. Cheilomacrocystidia similar but usually shorter. Pileipellis an ixocutis or ixolattice. REFERENCES: (Kauffman, 1918) Hesler & Smith, 1979. (Kauffman, 1918.) Herb. Kuo 09030206, 09040203. 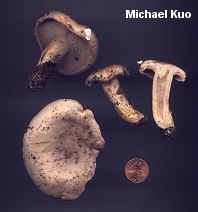 Kauffman (1918) originally named the mushroom described here as a variety of Lactarius trivialis with the following brief comment: "The northern form varies somewhat and needs further study; a variety also occurs in the north whose milk turns sordid green after exposure to the air, with broader and more distant gills and a spotted stem. This may be called var. viridilactis var. nov." Hesler and Smith (1979) retained Kauffman's taxon but transfered the variety to Lactarius affinis, giving it its current name. Two authoritative sources, Russulales News and MycoBank, list Kauffman's original taxon name (and, therefore, Hesler & Smith's later combination) as invalid according to the International Code of Botanical Nomenclature, citing Article 34, which says a "name is not validly published" when it is "not accepted by the author in the original publication" and when "it is merely proposed in anticipation of the future acceptance of the taxon concerned." The position taken by MycoBank and Russulales News represents a very strict and unforgiving application of the Code. Apparently, since Kauffman says the taxon "needs further study" and that it "may be called var. viridilactis" (my emphasis), we are being asked to invalidate his name--but I am not a taxonomist and maybe I'm just missing something. At any rate there is no alternative name for the mushroom, so we are stuck with Lactarius affinis var. viridilactis. Some field guide authors (e.g. McKnight & McKnight 1987; McNeil 2006) simply conflate var. viridilactis with Lactarius affinis--but I disagree with this approach since the latter taxon, as described by its original author (Peck, 1872) and by Hesler & Smith (1979) is yellowish brown without any hints of lilac, has a stem that lacks potholes, and has white milk that does not turn green (additionally it appears to favor hardwoods and has a slightly wider geographic range).